The dark green hijab is so contrasted with the festive florals that it seems someone has pasted a Muslim woman's head onto the body of a folksy German lady! (It's the pleats and the sleeves!) BUT it still looks quite good, not bad at all. I really like the dress and she has tied her hijab so nicely. The outfit would have been even better if the cardigan she is wearing was long sleeved and the trousers were a looser fit. longer sleeve would be more desirable.. but overall, cute! I love this photo! Sandals are really current, dress is sooo summery and the look on her face is happy, confident! Mashallah! She is sooo beautiful mashallah! i love the contrasting colours! modesty mixed in with todays wetern society! love it! what a nice style! 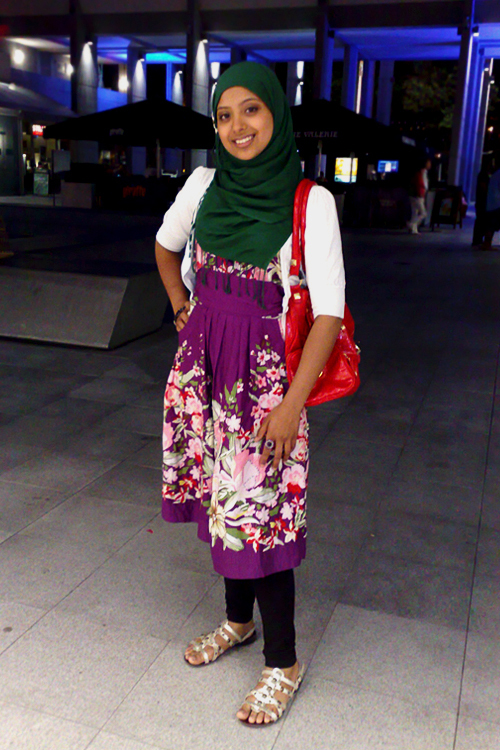 i found this style here in Bali, Indonesia, where the moslem girls wearing such colorful floral dresses, cardigans, and hijabs. pretty chic! i like it!